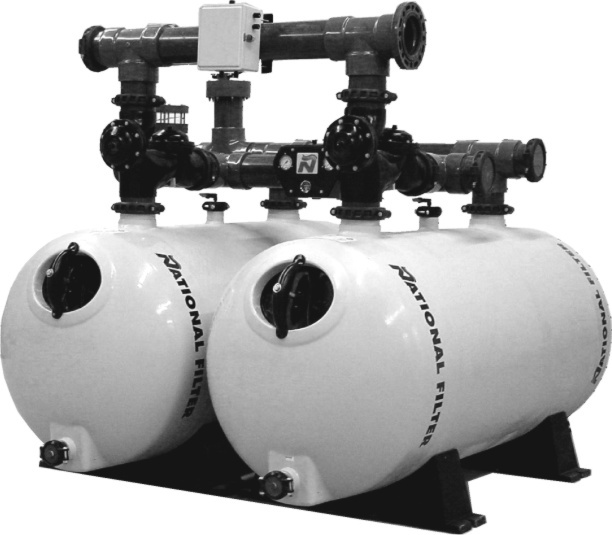 The Upper Distribution System in all National Series filtration systems, incorporate proprietary hydraulically engineered ABS plastic distribution lenses. The lenses are strategically placed to ensure a flat uniform media bed while preventing turbulence, media migration and channeling over a broad range of flow rates ranging from 5 to 20 U.S.G.P.M. per sq. ft. of filter area. The Lower Collection System utilizes 2" ABS plastic laterals to retain multiple types of granular filter media or a single grade of #20 or #30 silica sand. The laterals are strategically placed to produce minimum head loss due to full filter bed coverage. The laterals are self-cleaning due to a molded V slot configuration and promote thorough filter media cleansing through balanced fluidization during backwash. National LineT 34"- Series filtration systems have an exterior molded surface for control of the 34" overall outside diameter. The controlled outside diameter and lightweight modular design allows for handling without special lifting equipment. All National LineT 34"- Series filtration systems can be walked through openings as small as 34 ¼" for 50 P.S.I.G. systems and 34 5/8" for 100 P.S.I.G. systems. National LineT filtration system Housekeeping pads provide a reliable alternative to forming and pouring housekeeping pads on the job site. The housekeeping pad is suitable for use with filters, stacking stand or tank on tank designs. The housekeeping pads provide easy installation and with accurate centerline alignment due to self-locking tapered saddle support. The housekeeping pads are constructed of Fibercrete (Vinylester resin, sand, gravel, and rebar) are totally non-corrosive and have a high gloss gel-coat finish with UV protection. All housekeeping pads are manufactured to Seismic Zone 4 requirements. The lightweight, modular designs are economical to ship, and capable of supporting up-to a 80-sq. ft. stacked filtration system. National LineT filtration system stacking stands provide a reliable solution to floor space constraints. The stacking stand or tank on tank (for filament wound models only) designs allow for ease of installation in limited (81 1/2" for 34" diameter, 96" for 42" diameter and 140 ¼" for 60" diameter filter systems) head space and provides for accurate tank to tank centerline alignment due to self-locking tapered saddle supports. 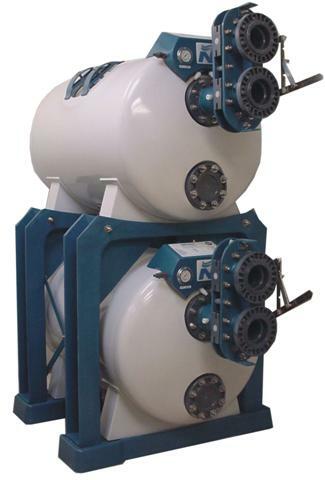 The stacking stand provides for independent support or the top filter tank, which facilitates individual removal of the bottom filter tank where site conditions permit. The stacking stands are constructed of Fiberglass Reinforced Vinylester Resin (F.R.P.) for 34" and 42" tank diameters and epoxy painted steel for 60" diameter filters. All National stacking systems are manufactured to Seismic Zone 4 requirements. The lightweight, modular designs are economical to ship, non-corrosive in design and capable of supporting up-to a 80-sq. ft. filtration system.